Sonic Acts XIII — The Poetics of Space: Spatial explorations in art, science, music and technology :: February 25-28, 2010 :: Paradiso, de Balie, NIMk and STEIM, Amsterdam :: 20% Early Bird discount on the festival until January 15, 2010! The thirteenth Sonic Acts Festival in Amsterdam is entirely dedicated to the exploration of space in performative and audiovisual art, film, music and architecture. 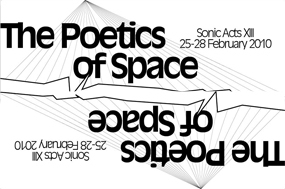 Sonic Acts XIII – The Poetics of Space examines the importance of physical space in times of far-reaching technological developments, and the physical and psychological impact of spatial designs. Researching spatiality in the arts forms the core of the festival. How is space defined by a work of art? What does a viewer or listener experience? How do technological artworks deal with the visual, auditory and psychological aspects of spatiality? How has the relationship between technology, space and architecture developed over the past few centuries? How have technological developments influenced our perception and representation of space, and how do we relate to the space that surrounds us? The programme comprises an overview of recent works and experiments – spatial audio compositions and audiovisual installations – and includes relevant historical examples and utopian ideals and dreams of the 20th century.